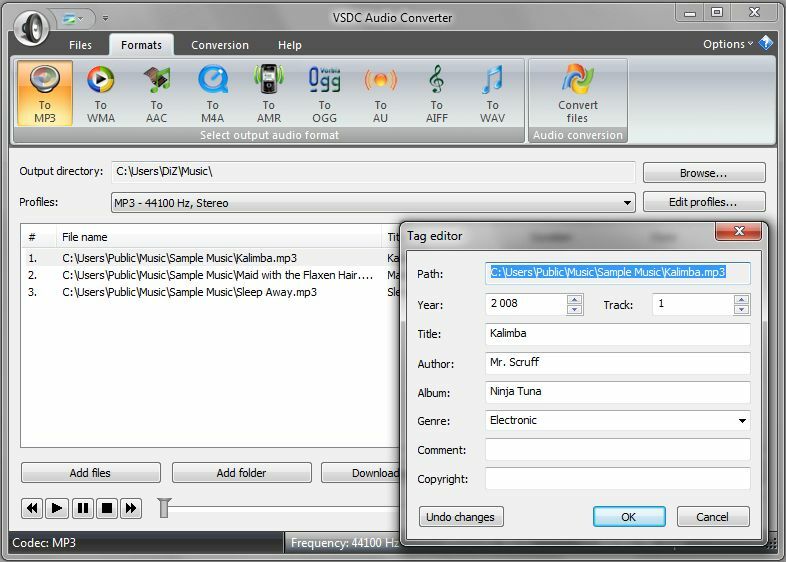 A fast, powerful, feature-rich and easy-to-use free audio converter. Its main purpose is to edit and convert audio files from one format into another. All popular audio formats are supported, such as MP3, Windows Media Audio (WMA and ASF), QuickTime Audio (MP4, M4A and AAC), Real Audio (RM and RA), Vorbis Audio (OGG), Mobile Audio (AMR), Creative Voice (VOC), Sun Audio (AU), Wave Audio (WAV and AIFF), FLAC etc. Any and all audio codecs are supported, including MP3, AAC, Vorbis, GSM and ADPCM. You can also open and convert M3U files, and audio files can be downloaded over the Internet. 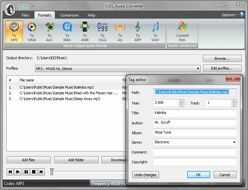 All popular audio formats are supported and all audio codecs. Supported formats: MP3, WMA and ASF, M3U, MOV, MP4 and M4A, RM and RA, OGG, AMR, VOC, AU, WAV, AIFF, FLAC, OMA and more. Using the export presets, you can choose the quality and format of the audio you want without having to think twice. The application has a huge number of presets covering all formats and multimedia devices. You can easily edit them yourself or create your own. Now you can save the audio track or a portion of it from a video file and create your own soundtrack in any audio format. Using the built-in editor, you can easily delete fragment of a audio from file. After conversion, the fragments will be removed from the resulting file. Now you can always download audio from a site and immediately convert it to another format. Conversion employs only high-quality audio processing algorithms, therefore there are practically no losses in quality; the conversion quality depends only on the preset which you choose. All of our products make use of multiple processors to speed up their work. Our program supports a wide array of technologies, such as Dual Core, Core Duo, Hyper-Threading and others.